AVA is a Primary Subconsultant to the Crenshaw – LAX Corridor General Engineering Team, responsible for station planning urban design & architectural and engineering design, art coordination and landscape design. The project alignment has three (3) underground stations, four (4) at grade stations and one (1) aerial multimodal station all with configurations that promoted. Transit Oriented Design opportunities for each station site are being studied. AVA studies several station underground configuration concepts request to reduce construction costs, by transferring ticketing & fare collection systems to the ground level or building underground stations off the roads on private property, or designing to side platforms one above the other, or utilizing a single large bore tunnel. All conditions of costs and operations were clearly highlighted for Metro, so as to finalize a single concept by concerns. AVA worked with local stakeholders to gain consensus on architectural concept for underground at grade and aerial stations, thru bold architectural statements and openings up opportunities for art and lighting. All station designed was developed to 65% (per contract) addressing constructability issues and ease of construction to reduce risk of schedule slippage and expedite construction by design builder to contain costs. Crenshaw – LAX Light Rail Transit (LRT) system is an integral part of the Regional Transportation Plan of Los Angeles County. Connectivity and mobility for the diverse Crenshaw communities are key attributes to the success of this Project. The Exposition Light Rail Line’s connectivity to the Crenshaw LRT system is a major challenge, as transit passengers from Santa Monica, Culver City and Downtown LA will transfer south for Los Angeles International Airport (LAX). Another challenge is to connect the Crenshaw LRT to the existing Green Line Light Rail and the LAX Airport People Mover System planned to connect various air terminals at Los Angeles International Airport. 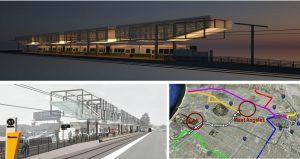 Also, the Harbor Subdivision Transit Corridor currently under study may provide express Commuter Rail, DMU or Rapid Bus system connection between Los Angeles Union Station, LAX, and the Ports of LA and Long Beach, and ultimately Orange County. There is also a possibility of a High Speed Rail connection to the Los Angeles International Airport (LAX) which could use part of this corridor. This is a Design Build Project.